New Easy Lettering Tutorials with a Pencil! Want to learn lettering but feel intimidated? Not sure which brush pens and paper to get? I’m taking fear out of the equation by showing you how to start lettering with just a pencil and paper. I’ll even send you the lettering exemplars I use in my beginner classes so you can follow along with me or practice on your own. Or you can just use lined notebook paper to start. 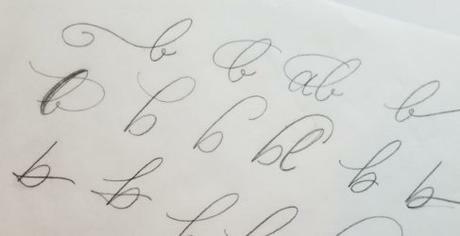 Below is a tutorial showing you how to draw the letter “b”. I show you how to create it in many different ways. Then I demonstrate step by step how to flourish the word bubble with lots of “b’s”. If you try it and find yourself liking it, pick up some tracing paper at any craft store and email me to request the lettering exemplars. You can find them at most stores where pencils are sold. I get them by the pack at Target. Then keep that pencil sharpened as I take you through the alphabet letter be letter! You can find more of my tutorials on my YouTube Channel. Want to take my Brush Lettering Classes on Skillshare for FREE? Get 2 months free here. Set up an account. Take as many classes as you like. Cancel before the 2 months is up and you pay nothing!